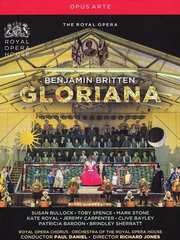 Central to The Royal Opera's celebrations of the centenary of the birth of Benjamin Britten was Richard Jones's witty and insightful new production of Gloriana, written to honour the coronation of Queen Elizabeth II. The opera explores the last years of Queen Elizabeth I, focusing in particular on her troubles and complex relationship with the hot-headed Earl of Essex. With powerfully characterised performances from a cast including Susan Bullock as the Queen and Toby Spence as the dashing but ultimately treacherous Essex, Gloriana is at once a celebration and a tragedy. Filmed in High Definition and true Surround Sound.